Teach your child the joy of wholesome food at an early age with Parent's Choice Organic Brown Rice &amp; Beans Baby Food Puree, Stage 2, 6+ Months. This puree is made with organic whole-grain rice, beans, and vegetables. Three types of organic legumes (pinto, navy, and black beans) combine with organic long-grain brown rice, onion, cilantro, and lime juice for a delicious, filling meal. 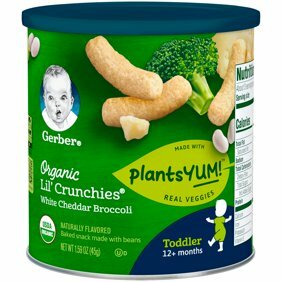 This meat-free food will satisfy your infant's hunger while also covering part of your little one's nutritional needs. Each pouch contains calcium and iron, as well as 25 percent of the recommended daily amount of potassium. The puree also has 2 grams of dietary fiber to aid with healthy digestion. Try Parent's Choice Organic Brown Rice &amp; Beans Baby Food Puree, Stage 2, 6+ Months, for a quick and nutritious meal for your happy infant. <br /> <br />Parent's Choice provides parents with baby and toddler products you need at a price that won't push your budget over the edge. We offer everything you need from bath time to bed time and every time in between, all with the high quality we know your little one needs. Parent's Choice is conveniently available online and in Walmart stores nationwide, allowing you to stock up, save money and live better. Teach your child the joy of wholesome food at an early age with Parent's Choice Organic Brown Rice & Beans Baby Food Puree, Stage 2, 6+ Months. This puree is made with organic whole-grain rice, beans, and vegetables. Three types of organic legumes (pinto, navy, and black beans) combine with organic long-grain brown rice, onion, cilantro, and lime juice for a delicious, filling meal. This meat-free food will satisfy your infant's hunger while also covering part of your little one's nutritional needs. Each pouch contains calcium and iron, as well as 25 percent of the recommended daily amount of potassium. The puree also has 2 grams of dietary fiber to aid with healthy digestion. Try Parent's Choice Organic Brown Rice & Beans Baby Food Puree, Stage 2, 6+ Months, for a quick and nutritious meal for your happy infant. Parent's Choice provides parents with baby and toddler products you need at a price that won't push your budget over the edge. We offer everything you need from bath time to bed time and every time in between, all with the high quality we know your little one needs. Parent's Choice is conveniently available online and in Walmart stores nationwide, allowing you to stock up, save money and live better.